Many dog owners are fuming after a radio show went on air to make a "prank call" to an unknowing citizen. Although some prank calls are hilarious, this one in particular was offensive. Voices For The Breeds and Anti Dogfighting Campaign have tried with great patience, to obtain a public apology. Yet it seems as though they refuse to do the right thing, by making that apology. On top of not making that public apology they have removed several comments asking for the public apology. These comments included facts and truths about the bully breeds and pit fighting. 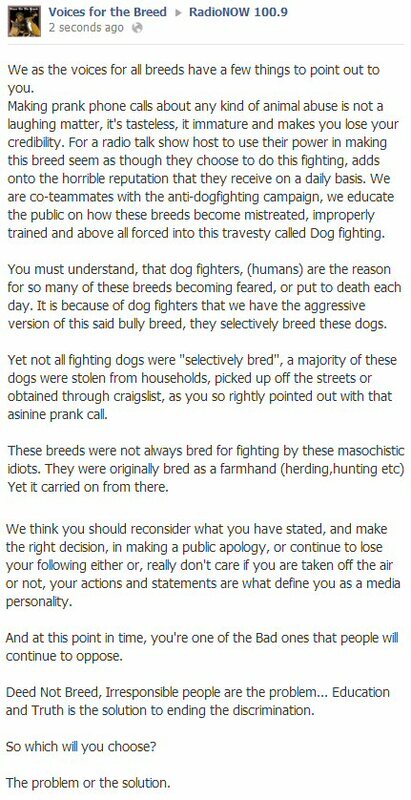 One in particular comment they have removed from their facebook page, was the one from the founder of the Anti-Dogfighting campaign. help these fighters continue on their torture of these animals. Carmen, you should publicly apologize for doing a prank like this. to protect these animals at all costs. They also removed Voices For The Breeds comment as well. Not only did this radio show add onto the bad rap of the bully breeds, yet it also made all possible dog owners look like a fool, or should I say irresponsible. Carmen was stereotyping while she made the prank phone call and obviously the victim of this prank call wasn't too happy about this situation either. There is also another factor, people that follow this radio show seem to be desensitized by the reality of this horrible situation. As I have stated before all dog owners not just bully breed owners are fuming at the Prank Call Radio show. Abuse is never a laughing matter, neither is dogfighting. Lighten, ease up? We refuse too, because this has become a serious matter. We see this abuse everyday, we work on cases with the HSUS to fight against Dogfighting. We work with authorities to lock these dog fighters up. We speak with truth and facts to defend our bully breeds and all dogs. This stereotypical media persona's can do so much damage when they make shows like the one Kyle & Rachel has done. All of us will stand united against RadioNow 100.9 until they make a public apology or we will do it the hard way, and make a petition to have them publicly apologize and remove the person who is either Carmen or Carmen herself. Be part of the voices for victims, stand up for what you believe in and for what we are fighting for. We will not be silent, we will become louder, we do not forgive those who would cause harm. We will be there when we are needed. A petition will be started soon if this continues. And it will be linked on the Voices for the breeds Facebook page as well as here.